ABSOLUTELY GORGEOUS REMODEL-JUST COMPLETED!! 3 Bedroom, 2 Bath, 2 Car Garage Home located on Golf Course with BEAUTIFUL WATER VIEW AND EASTERN EXPOSURE! ALL BRAND NEW: SOFT CLOSE WOOD CABINETRY IN KITCHENS + BATHS, GRANITE IN KITCHEN AND BATHS, PLUMBING FIXTURES, COMMODES, SINKS, PAINT, CARPET IN ONE BEDROOM, LIGHTING, UPPER END STAINLESS STEEL APPLIANCES (25 CF. FT. French Door Refrigerator), LUXURY VINYL FLOORING-WATERPROOF WITH LIFETIME WARRANTY, ALL NEW 5" PLUS BASEBOARDS, and NEW FANS ON LANAI. EXTERIOR NEWLY PAINTED FALL OF 2018. OVER $40, 000 HAS BEEN INVESTED FOR ONE LUCKY BUYER! Home was recently RE-PIPED, Water Heater is newer, New AC System 2014, Roof is 11/29/2004. 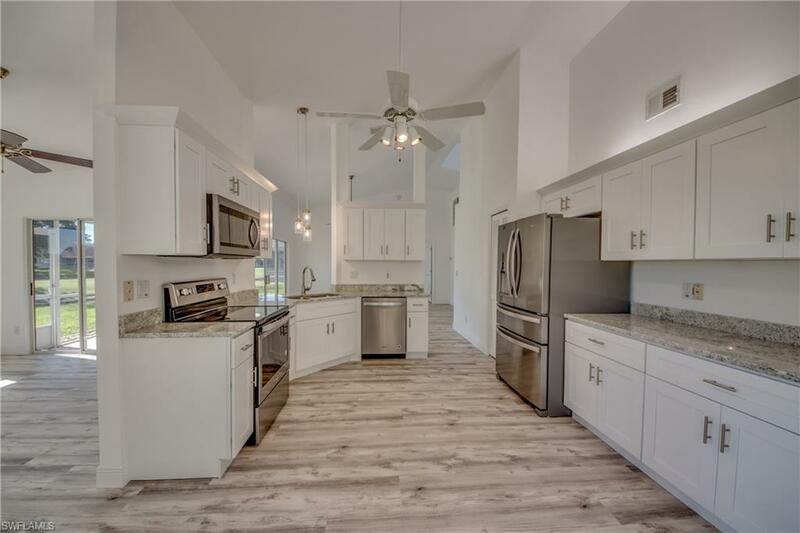 This Split Floor plan also boasts a Large Lanai, Eat-In Kitchen, Formal Dining Room with Bay Windows, Spacious Great Room, Walk-In Closets in all 3 Bedrooms, Screened under truss Entry, and Large Utility Room with Laundry Tub and Additional Storage Cabinets. Additional refrigerator in garage. Don't Miss Our Virtual Tour! SUPER VALUE-PRICED TO SELL QUICKLY! !